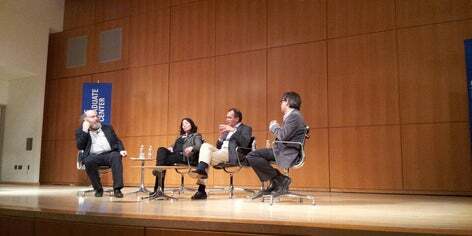 On May 6th, having just returned from quick trips to Cleveland and Atlanta, I attended with my wife the round table debate “Curiosity, Understanding, and Utility: Science and the Creative Economy” held at the City University of New York Graduate Center’s Proshansky Auditorium. William Bialek, director of the Graduate Center’s Initiative for the Theoretical Sciences, moderated a discussion with Jennifer Tour Chayes, distinguished scientist and managing director of Microsoft Research New England and Microsoft Research New York City; Fernando Pereira, research at Google; and Chris Wiggins, chief data scientist at the New York Times and faculty member in the Department of Applied Mathematics and Applied Physics at Columbia University. After the round table my wife and I were requested to join the panelist in a private reception at CUNY President’s Office, where we had the delightful opportunity to engage in very stimulating conversations. So much so that we did not even try the great looking sushi that was being served! Interesting how two days later I was talking about those very same issues in a completely different setting: at Grace Hoadley Dodge Vocational High School, where I do volunteer work mentoring a Bronx teenager.